For Conceptboard users in large teams and those that work on public boards, your contact lists could get kind of messy in the past. 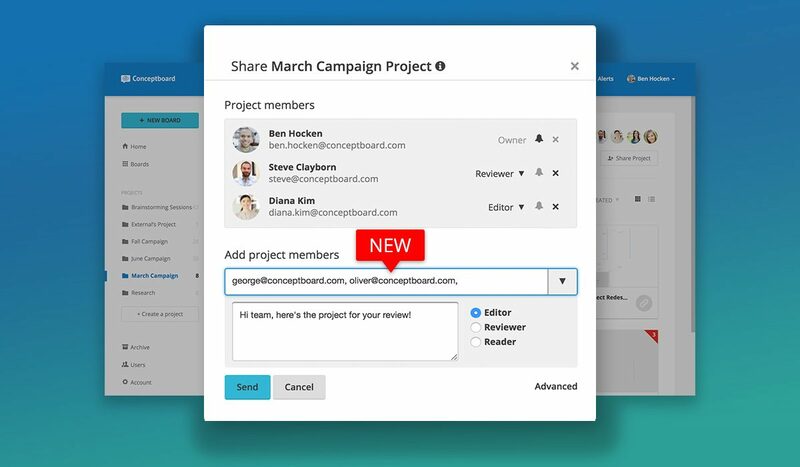 Before, all your team members and every user who ever happened to have visited the same board as you, would automatically be added as your contact, and available for you to share content with and @mention. As a result, picking a colleague was kind of cumbersome, because you had to choose them out of thousands of entries every time. To avoid this in the future and especially to make collaboration in big teams easier we’ve introduced the new personalized “My contacts” list. To complete this update, we’re also introducing project invitation via email – a feature many users have asked for. @mentioning people is much faster with the new “My contacts” list. The list is filled automatically with your closest collaborators, and can be managed easily. How does the new “My contacts” list work? The first time you log into Conceptboard after the update, you might find your @mentions list much smaller. It now only contains your closest collaborators – and all the board’s participants. If you want to @mention new participants, just invite them via their email to the board: this will add them as a participants and as a personal contact of yours. Your personal contacts can be managed with your “My contacts” list in your users page. Your personal contacts are filled automatically with people that you invite via their email to a board, a project or your team. In these cases a “contact” is created vice-versa. You can also manually add people to your contact list. Wherever you see a user’s profile icon, you can click on the icon to get more information about them, and find an “Add to contacts” button (which only makes them a contact of yours, and not vice-versa). If you want to batch-update your contacts with people from your team, you can find the people you’re looking for by their name or email address in your team directory. Click on the dot menu in the right hand side and then on “Add to contacts”. We’ve also included a new update to our Projects! 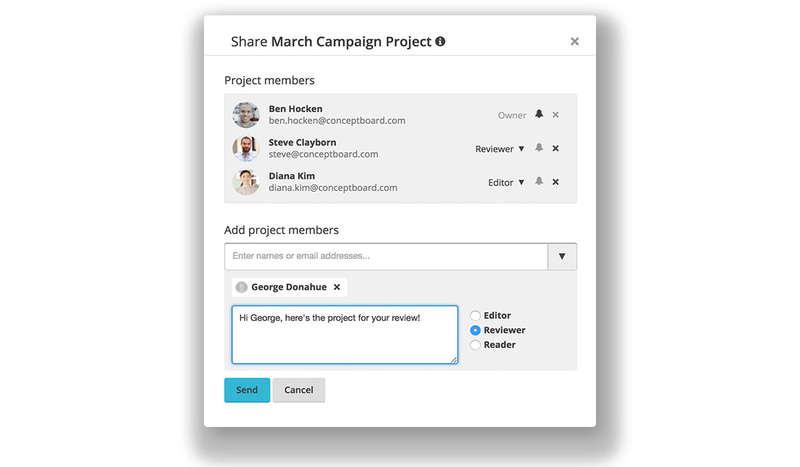 You can now directly paste in multiple email addresses to share a project with your team members. 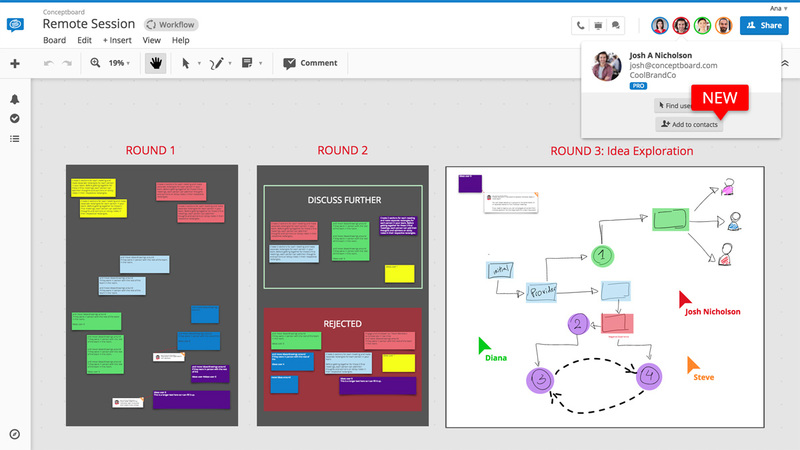 This will also allow you to send out a custom message with your Project invitations. The Project dropdown will now show you only team members that are on your “My contacts” list. To automatically add someone to your contact list, share the Project with their email address, or go to your Users page and add them to your contacts list first, and then you can use the dropdown to share a Project with them. A small note: Pending invitations and team members who have not activated their email address can’t be added to a Project.